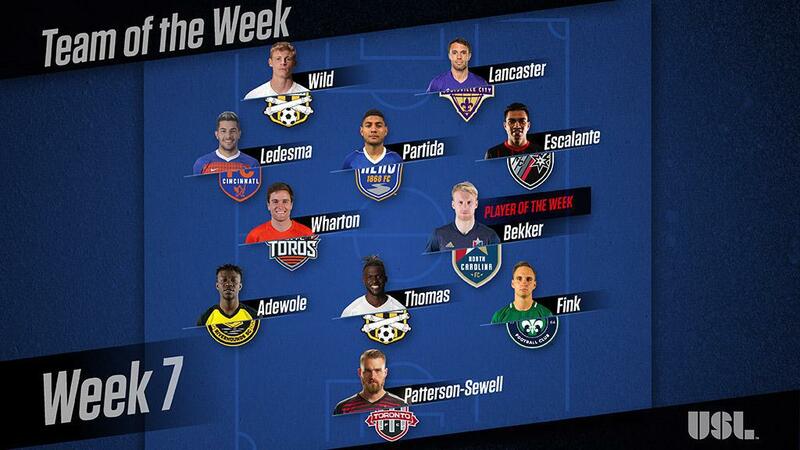 TAMPA, Fla. – North Carolina FC midfielder Kyle Bekker has been voted the USL Player of the Week for Week 7 of the 2018 season. Bekker scored once and notched two assists to lead NCFC to a 3-0 victory against Penn FC on Saturday night that extended the club’s undefeated streak to four games and earned its first home win of the season. Bekker received 47 percent of the poll conducted by a national panel of independent media representing every USL market. Charleston Battery forward Gordon Wild finished second with 26 percent. GK – Caleb Patterson-Sewell, Toronto FC II: Patterson-Sewell recorded a shutout that included a penalty-kick save to deny New York’s Stefano Bonomo as TFC II claimed its second draw of the season. D – Skylar Thomas, Charleston Battery: Thomas won 16 of 24 duels overall during the Battery’s two victories against Atlanta and Tampa Bay, while recording seven tackles, four interceptions and 12 clearances. D – Sam Fink, Saint Louis FC: Fink recorded a key late goal-line clearance to cap a performance that also saw him win eight of 13 duels and complete 33 of 39 passes. D – Tobi Adewole, Pittsburgh Riverhounds SC: Adewole recorded three tackles, two interceptions and eight clearances and won eight of 13 duels as the Hounds recorded their fifth shutout in 1-0 win vs. Atlanta. M – Todd Wharton, Rio Grande Valley FC: Wharton recorded one assist, four key passes and 35 of 38 passes, while winning five of seven duels in the Toros’ 2-0 victory against Orange County SC. M – Emmanuel Ledesma, FC Cincinnati: Ledesma notched a goal and an assist in Cincinnati’s 3-0 victory against Ottawa Fury FC on Saturday, while finishing with three key passes and three shots on goal. M – Kevin Partida, Reno 1868 FC: Partida scored a tremendous opening goal in Reno’s 2-0 victory against OKC Energy FC and completed 34 of 40 passes in a tidy display in midfield on Saturday night. M – Kyle Bekker, North Carolina FC: Bekker had a goal and two assists as North Carolina ran its undefeated streak to four games with a 3-0 victory against Penn FC on Saturday night. M – Jose Escalante, San Antonio FC: Escalante scored the second goal of the night and also won a penalty kick, as SAFC handed Las Vegas Lights FC its first loss of the season in a 3-1 win on Friday night. F – Gordon Wild, Charleston Battery: Wild scored his first two professional goals to lead the Battery to a 3-0 victory against ATL UTD 2 last Tuesday night. F – Cameron Lancaster, Louisville City FC: Lancaster scored twice to lead Louisville to its fifth win in six games this season in a 3-1 victory against Bethlehem Steel FC on Saturday night. After a week that produced an array of spectacular strikes, which one gets your vote? ©2019 United Soccer League / SportsEngine. All Rights Reserved.